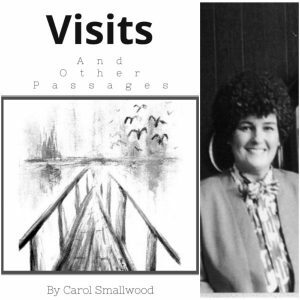 Visits and Other Passages by Carol Smallwood is a collection of poems, short essays, observations and vignettes that take the reader on an intellectual, yet deeply personal odyssey. A reader of this volume quickly realizes that the author is not just a mere observer, but an active participant in a magnified life. Indeed, she mentions viewing events through the prism of a magnifying glass on several occasions. What she compels the reader to come away with is the realization that life in all its ordinariness is not mundane but fantastic and fascinating, and awful and wonderful, simultaneously. And that “the strangest thing of all was not to see how strange things really were” (6). The book lucidly moves through sections that hold us riveted through visits from a snippy Avon lady to stories peopled with familial figures such as aunts, uncles, and cousins. Contemplative vignettes highlight thoughts on writers as diverse as Hemingway and Isak Dinisen. The delicate rendering of the ordinary is infused with the philosophy and disparate principles of these writers. Simple actions such as people-watching become linked to Chaucer’s Canterbury Tale because the gem in his tales is that there are, “people so alike and so unalike, so endlessly interesting” (13). Though Smallwood references more writers of prose than poems, her sure poetic hand and knowledge is evident in the formal verses she pens. Her sonnets, pantoums, villanelles and tercets, triolets and rondeaus seem effortless and the rhymes move at a pace that never feels forced or contrived. The lovely cinquain, “Prufrock Napkins,” is elegant in its intertwining of crash fast-food joints with sublime T.S. Eliot images of fog and rooms and women who “come and go/talking of Michelangelo” (37). Smallwood’s prose is brimming with poignancy and explores the ultimate loneliness of twenty-first century technology. “Will the owners of computers take over the custodianship of culture and knowledge?” she wonders (79). Libraries seem quaint now and out-of-step. “… everything changed,” she writes, “… if you just looked, you saw libraries giving way to the electronic pursued by the fear of becoming obsolete” (84). With emotional acuity, Smallwood shakes us with the hard realization that we are aging into a social anthropology dominated and controlled by youth. A young woman passes Smallwood and “she looked through me, preferring, perhaps, not to see herself sitting there when she got my age” (85). Smallwood lifts us out of these personal observations in the fourth section of her book that delves into the beauty of the natural world and how everything is linked through the awareness and concentration of science. An invasion of butterflies, moving tectonic plates and whirling planets all pull the reader forward and out of ourselves. The fact that we are all connected is, finally, a welcomed cliché but Smallwood is not content with letting us sleep peacefully with this collective actuality. She warns, “…it is in this subterranean well that the best and worst of us lurks and I think writing is dipping into this well … sensing it best not to got too far or else we’ll never return—or if we do, are forever changed and do not belong any more” (109). Barbara Ellen Sorensen is former senior editor of the American Indian Science & Engineering Society’s flagship publication, Winds of Change. Sorensen is a contributing writer to the Tribal College Journal. Sorensen has had three books of poetry published: Songs from the Deep Middle Brain (Main Street Rag, 2010), Compositions of the Dead Playing Flutes (Able Muse Press, 2013), and Mary’s River (Kelsay Books, 2018). Her first book was nominated in 2011 for a Colorado Book award.